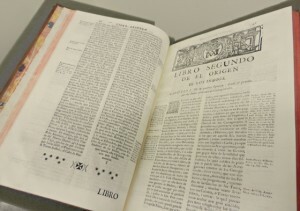 In addition to the over 7,000 linear feet of archival collections made available for study at the University of Houston Special Collections, we are also proud to offer over 100,000 rare books for use in our reading room. Each month we will highlight an item from our collections and what makes it so special. Location: Anyone interested in viewing these full-course-meals masquerading as morsels of comedy, history, and tragedy are invited to visit the UH Special Collections Reading Room during our normal hours of operation. 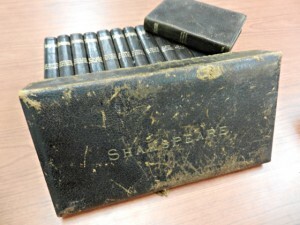 The Handy-Volume Shakespeare may be called via PR2753 .D2 1885. Magnifying glass available upon request. In addition to the over 7,000 linear feet of archival collections made available for study at the University of Houston Special Collections, we are also proud to offer over 100,000 rare and antique books for use in our reading room. Each month (some more dutifully than others) we will highlight a text from our collections and what makes it so special. In the spring 2015 semester we had the good fortune to host our first-ever UH Special Collections Social Media Intern, Shelby Love. As part of her duties, Love curated a number of selections for our Book of the Month series here on the blog. For this month (and many to come, no doubt) we share a Book of the Month selection from Shelby Love. Book of the Month: The Vision of Hell by Dante Alighieri, translated by Henry Francis Cary, and illustrated with the designs of M. Gustave Doré. Why so Special? 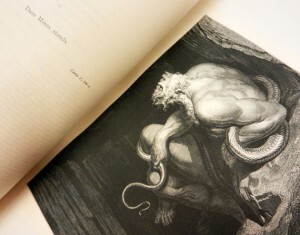 In this 1866 edition, Dante Alighieri’s literary masterpiece is skillfully presented through the two archetypal interpretations of Henry Francis Cary and M. Gustave Doré. 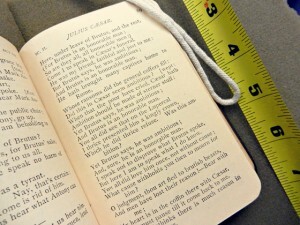 Cary, a graduate of Christ Church College, Oxford and assistant librarian in the British Museum, translated the Divine Comedy from Italian to English in the early 1800s. Despite the availability of numerous alternative translations, Cary’s version remained the standard into the twentieth century. That would be over 100 years of beating his competitors. In fact, his poetic translation was admired by other literary giants such as Wordsworth, Keats, Lamb, Coleridge, Macaulay, and Ruskin. Cary dedicated countless hours and even his own funds to complete the project for public consumption, truly a meritorious example of just how important our librarians are to society. The second distinguished interpretation is through Doré’s vivid illustrations of the otherworldly adventure. Doré was an incredibly successful and productive French illustrator and printmaker in the 19th century known for his imaginative and fantastical artwork. His work was mainly centered around themes like the (pessimistic) fate of mankind and meditations on life and death, making him and Dante such a compatible ideological pair, the likes of which even match.com couldn’t hope to recreate. In fact, one contemporary critic found the illustrations to be so conscientious that he suggested Doré and the long deceased Dante were communicating through the occult. Dante enthusiasts and scholars still consider Doré a determiner for how the Divine Comedy is visualized by readers today, ranking his hypnotic renderings along with those of Sandro Botticelli, William Blake, Eugène Delacroix, and even Michael Angelo. With a detailed red and gold hardcover, this edition is one of the most eye-catching items among our larger-format books. The sheer size of it can strike the modern day book lover as both whimsical and puzzling, eliciting the question, why would such a serious classic need to be so colossal? A rewarding perusal in the reading room will reveal a uniquely intimate way to engage with Dante’s beloved classic as Cary’s poetic translation of the writer’s imaginative vision is presented side by side with Doré’s exquisite renditions of the literary masterpiece. 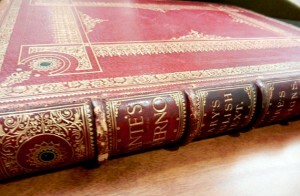 This incredible edition contains the crowning achievements of three fruitful lifetimes, brought together by one vision. Location: Those interested in consulting with this edition of Dante’s classic may request call number PQ4315.2 .C4 1866 in the Special Collections Reading Room. 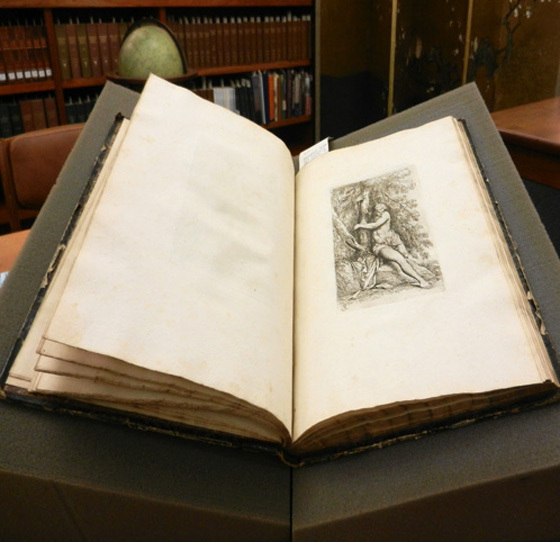 Book of the Month: Salvator Rosa has ludentis oty Carolo Rubeo singularis amicitiæ pignus D.D.D. 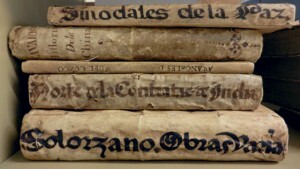 In addition to the over 7,000 linear feet of archival collections made available for study at the University of Houston Special Collections, we are also proud to offer over 100,000 rare and antique books for use in our reading room. Each month we will highlight a text from our collections and what makes it so special. This spring semester we have been fortunate to host our first-ever UH Special Collections Social Media Intern, Shelby Love. 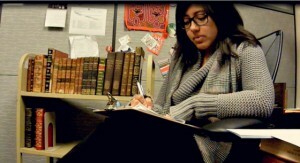 As part of her duties, Love has been curating our Book of the Month series here on the blog. For this month (and many to come, no doubt) we share a Book of the Month selection from Shelby Love. Why so Special? Salvator Rosa has ludentis oty Carolo Rubeo singularis amicitiæ pignus D.D.D. 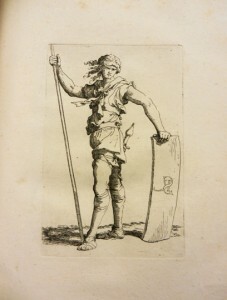 is a series of etchings by Salvator Rosa, an Italian painter and printmaker. The book was dedicated to Rosa’s Roman patron Carlo de’ Rossi. The book contains beautifully detailed portraits of peasants, women, and groups of soldiers as well as some mythological scenes. Rosa is considered to be one of the most original artists and bizarre characters of the 17th century. The collection in this book features many etchings from Rosa’s figurine series, which went on to influence many Italian artists as elegant “stock” figures to incorporate into their works. Without the ability of color, Rosa’s traditional prints illustrate the versatility of the line to distinguish subject from object, light from shadow, and detail from outline. This item presents a rare opportunity to experience the intricate and original artwork without the unfortunate distortion and separation of museum glass. The texture of the plate is softly written into the fabric of the paper and the viewer can also see the indention made into the paper from the plate’s edges after being run through the engraving press. These details bring the viewer excitingly close to the printmaking process that was used to create these images in a way that only originals can. Aesthetically engaging and enlightening, this collection by Rosa is just one captivating gem in Special Collections. Location: Those interested in viewing this series of etchings in person may request call number ND623.R7R7x in the Special Collections Reading Room. Book of the Month: The Spirit of Houston. 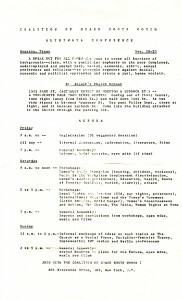 The First National Women’s Conference. An Official Report to the President, the Congress, and the People of the United States. Book of the Month: The Spirit of Houston. 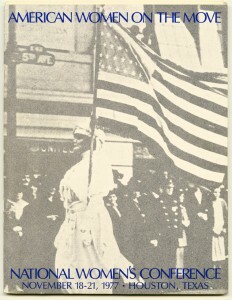 The First National Women’s Conference. An Official Report to the President, the Congress, and the People of the United States, published by President Jimmy Carter’s National Commission on the Observance of International Women’s Year. Why so Special? A number of reasons, really. First, there’s the timing. Whether you’ve been celebrating Women’s History Week since 1981 or you go all the way back to 1909 and celebrated International Women’s Day last weekend, one thing is certain–March is Women’s History Month. Then, what time like the present to view this report and delve back into a history that captures a moment in time when so-called second-wave feminism was on the rise, the world was beginning to notice, and, for a moment, Houston found itself at the epicenter of the domestic debate and struggle. Or, maybe what makes this report so special is the tip of the research iceberg it represents. The Spirit of Houston… is just one title in the larger Peggy Hall Collection. Hall was a charter member of Houston Area NOW, active member of the Harris County Women’s Political Caucus on issues related to the ERA, and witness to the events of 1977. 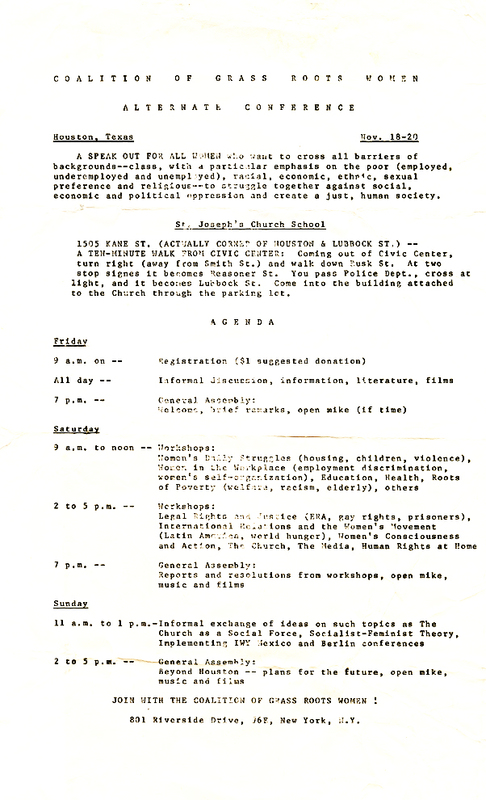 Examples of other works comprising the collection bearing her name include Notes from the Third Year: Women’s Liberation (a collection of radical feminism that includes Judy Syfers’ biting essay “I Want a Wife,” just prior to its appearance in the premier issue of Ms. magazine) and the iconic 1972 Our Bodies, Ourselves. But, if you had rather keep your focus on the First National Women’s Conference, maybe you would be interested in the Marjorie Randal National Women’s Conference Collection. 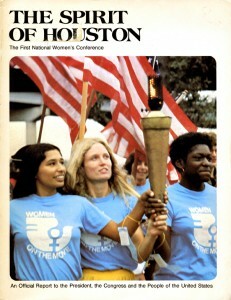 Randal, an active supporter of women’s rights in the greater Houston-Galveston-Gulf Coast region, was also involved in the events of 1977 and played critical roles in establishing local NOW chapters. 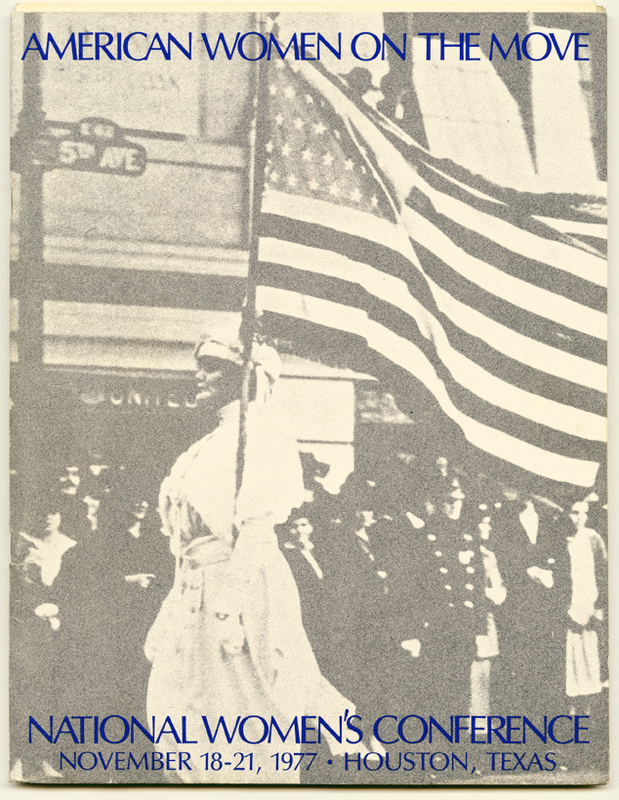 Her collection features correspondence, newsletters, publications, and other assorted materials dating from the mid 1970s into the 1980s, with the bulk of the materials focusing on the critical year of 1977 and the National Women’s Conference. Location: The Spirit of Houston… is available for study this and every month in the University of Houston Special Collections Reading Room (call number HQ1403.N34 U54 1977). Interested in viewing this report or any of the other resources mentioned above? 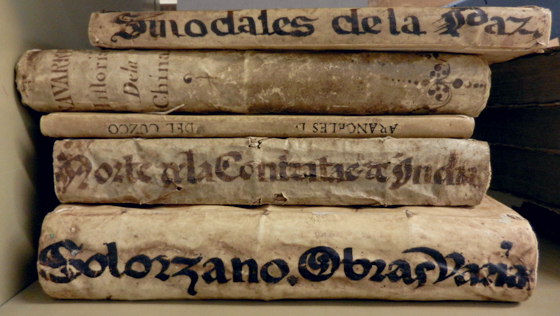 Then, we look forward to your visit to Special Collections.